Home > Medicines and Vitamins > Are Painkillers Safe to Take During Pregnancy? When you’re pregnant, it’s normal to find that some of the things you take for granted in ordinary life, like immediately reaching for the painkillers when you’ve got a headache, become something you need to think twice about. With the safety and health of your growing baby a key priority, is it safe for you to take painkillers during pregnancy? Various studies have been carried out looking at the safety issues involved in the use of painkillers during pregnancy. A Danish study published in November 2010 found that a prolonged use of painkillers in pregnancy could pose a risk to unborn babies, especially boys. Regularly taking painkillers during the second trimester, from 14 to 27 weeks, was highlighted as being a particularly sensitive time. Which Painkillers Are Safe To Take When Pregnant? 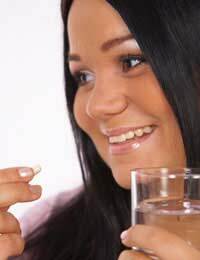 Many pregnant women worry about the safety of taking over-the-counter drugs and painkillers when they’re pregnant, as any medications that are taken can cross the placenta and enter your baby’s bloodstream. In an ideal world, it may seem like a nice idea to avoid them completely, but in reality it’s not always possible for the entire nine months. Although the research into pregnancy painkillers sounds scary, the point to keep in mind is that appears to only be a risk if you take painkillers on a regular basis. Paracetamol is still regarded as the safest painkiller to take during pregnancy. You still shouldn’t take it too regularly, but used occasionally, it should be fine. The advice from medical practitioners in the UK is to avoid drugs such as Ibuprofen, Codeine (unless advised by your doctor) and Aspirin whilst you’re pregnant. Although there’s no major evidence that Ibuprofen could be harmful during the first and second trimesters, it has been found to cause problems in the third trimester. It’s been shown to lower levels of amniotic fluid and could affect a baby’s development. For this reason, rather than worrying about when it is and isn’t safe to take it, it’s best to avoid Ibuprofen entirely for the duration of your pregnancy. If you’ve already taken Ibuprofen, perhaps not realising you were pregnant, then don’t panic, as an occasional dose is unlikely to cause problems. There’s no need to get stressed about the painkiller issue, but is advisable to think about what you’d do and how you’d treat a headache. During the first trimester of pregnancy, headaches can be quite common and you’re more likely to get them if you’ve previously been susceptible to headaches. Taking paracetamol occasionally should be fine and it’s regarded as being the safest painkiller for pregnancy. However, it’s also worth considering alternative headache remedies too. For example, you can buy various types of natural headache balm that can be applied to your head (some versions contain peppermint or lavender) and they have a soothing effect, which help relieve a headache. There are also cooling strips that can purchased to put on your head to ease a headache - they may look a bit daft, but it can reduce the need to take painkillers! Dehydration can also be a common cause of headaches, so drinking a large glass or water can sometimes ease the symptoms of a headache. Other people benefit from gentle head massages. If a natural remedy doesn’t ease the headache, then paracetamol can be your next port of call.